The leader of Colombia's largest armed rebel group, the Farc, has said he ordered the organisation in September to stop buying guns and ammunition. Rodrigo Londono Echeverri, known as Timochenko, said the decision showed the Farc's commitment to scaling down the conflict with the Colombian army. The left-wing group and the Colombian government have been engaged in peace talks for nearly three years. Both sides say they are expecting to sign an agreement in March. Some 220,000 people are estimated to have been killed since the Revolutionary Armed Forces of Colombia launched its armed struggle in 1964. Peace talks were launched in the Cuban capital, Havana, in November 2012. The aim is for the rebels to give up their armed struggle and join the legal political process. Timochenko's announcement came in a tweet to Colombian President Juan Manuel Santos. Image caption "On 30 September 2015 I ordered all of the Farc's units to suspend the purchase of guns and ammunitions." There has been agreement on four broad points on the agenda: the political participation of the rebels, land rights, drug trafficking, and most recently, transitional justice. 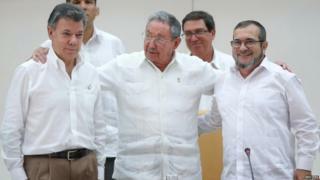 When the two sides announced a deal on the issue on 23 September, President Santos flew to Cuba. The president shook hands with Timochenko for the first time. He also set a deadline of six months, until 23 March 2016, for the signing of a final peace agreement. The rebels have said they would like to sign a peace deal even before that date. But both sides are still working on a number of issues and the implementation of the agreement. A final deal will need to be approved by the Colombian people in a referendum. Last month, Mr Santos announced he was willing to join the Farc in a bilateral ceasefire from 1 January 2016 if there is significant progress in the negotiations. The rebels have already declared a truce. Mr Santos has also suspended radio and television campaigns to encourage the rebels to leave the Farc, in what he described as a goodwill gesture. Demobilisation campaigns would usually be reinforced in the weeks leading to Christmas.